One of the things I really do not like about the original Statis-Pro Footbal game is the player rating. Players with a rating of 4 could be played once a half. Often they had the best cards due to a limited amount of stats. For example, if someone ran the ball once a season and got 15 yards on their one run attempt, their card would make them almost unstoppable on the ground. 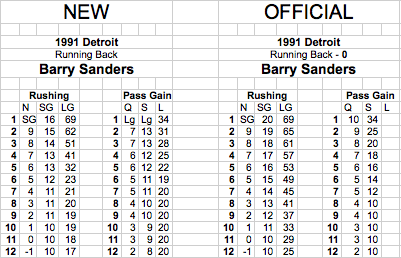 This is because the original cards only took the average rushing into account. The average for 15 yards a carry, so the card would reflect that. It didn't matter that there was only 1 carry. The effect was more pronounced in receivers. When I redesigned the process, I wanted to use a minimum of stats, mainly due to the fact that many detailed stats were just not available for earlier seasons. One way of doing this was to make a rough guess at the standard deviation to understand how often a person gained a certain amount of yards. Doing this would differeniate a player that averaged 4 yards a carry, but ran for 1300 yards versus a player that averaged 5 yards a carry, but ran for 1100 yards. The former would have smaller numbers due to average, but more of them would be above average. The latter would have larger numbers up front, but smaller numbers at the end. On the original card, he had better normal and short gain numbers than Barry Sanders and Emmitt Smith, the two leading rushers that season. 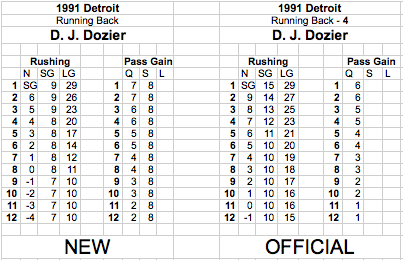 Because of the relative rarity of a breakaway run, DJ Dozier would be a very desirable card if it weren't for the pesky rating of 4 under his name. With the new version of the card, he can play all he wants, but he is now much less valuable. He can still breakaway for 20+ yard gain (He had two that year), but otherwise he will not dominate anyone's offense. Wait a minute, didn't Emmitt take the rushing title that year? Why does he have a worse New card than Barry Sanders? The main reason is that he had a lower yards per carry, 4.3. After considering his 75 yard run, he really didn't have any other huge runs that year. (I need to confirm this, I don't have the stats for him in front of me right now.) Despite catching more passes, his average per reception was more than two yards lower than Sanders. 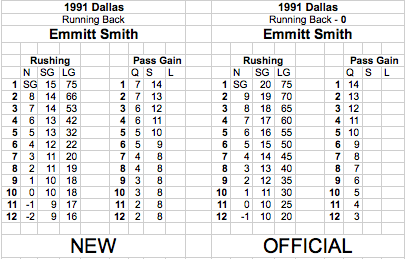 The ultimate reason that Emmit's card is not as valuable as Barry's is that Barry had more yards from scrimmage that year at a higher averages than Emmitt. You know, of course, that this system make Thurman Thomas' card the most valuable RB card in 1991. He led the league in yards from scrimmage. Next time I talk about Stais-Pro, it will be time for QBs and WRs.